The capital of Tuscany lies on the banks of the Arno between the Adriatic and Tyrrhenian seas, near the center of the Italian peninsula. It is a city that bustles with industry and crafts, commerce and culture, art and science. The Chianti region between Florence and Siena is one of the most beautiful landscapes in Italy and a famous wine production area. 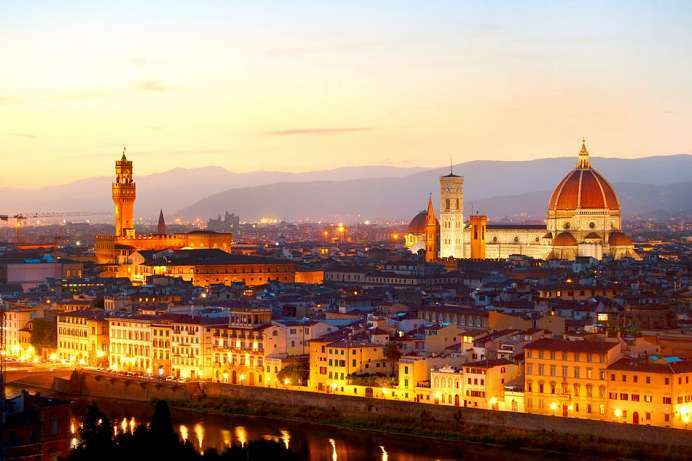 Founded by the Romans in the first century B.C., Florence reached its pinnacle between the 11th and 15th centuries, when it was a free city balancing the authority of the Emperor with that of the Pope. In the 15th century it came under the rule of the Medici family, who later became the Grand Dukes of Tuscany. 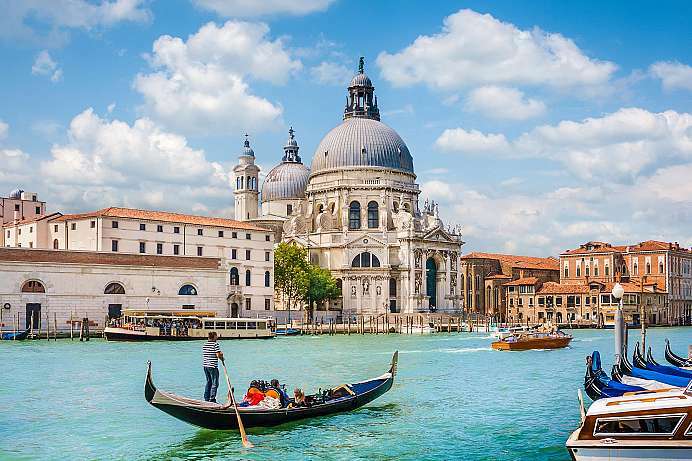 The city is considered the cradle of the Renaissance and humanism and was a leading center of art, culture, politics and economic power during this period. The universal geniuses Leonardo da Vinci and Michelangelo thrived here. Their works, along with those of many generations of artists up to the masters of the present century, are gathered in the city's many museums. The basilica was already consecrated in 393 AD, making it most likely the oldest church in Florence. Many hundreds of years the massive hall had been the central city church before being replaced by Santa Reparata and later the Duomo. Its present appearance dates back to the 15th century. Once again it was the Medici family, who financed the reconstruction. The outside of the church seems a lot simpler than its interior, which is owed to disagreements between the awarding authority and the famous architect Brunelleschi. Despite or possibly because of these tensions: The result is impressive. A masterpiece is the painting inside the dome. 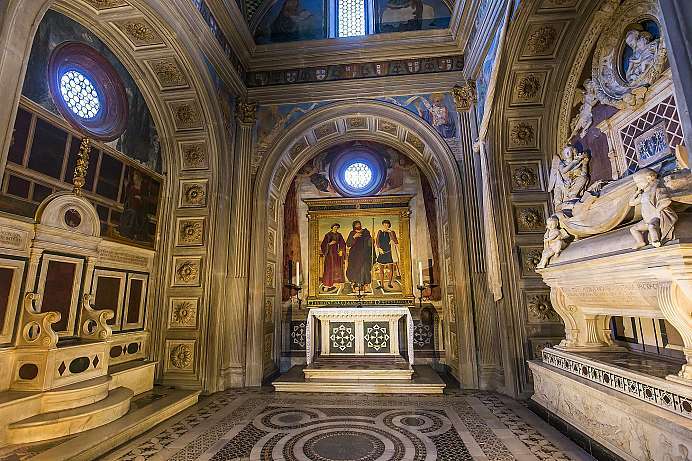 Evidence of the lavish wealth is also the Cappella dei Principi, which is studded with semi-precious stones. The Cathedral of Florence is the fourth largest church in Europe. The huge building emerges visibly from the cityscape. Especially prominent is the dome with a total height of 114 meters. Begun in 1296 the structure was always meant to be monumental, also in order to outdo Pisa or Venice, the competitors at the time. The works however quickly stalled and weren't fully completed until 1887. Besides the dome the freestanding bell tower with twelve bells and a height of 85 meters is especially striking. Also the interior is monumental. A masterly achievement is the ornamental painting of the dome: an area of 4000 square meters. 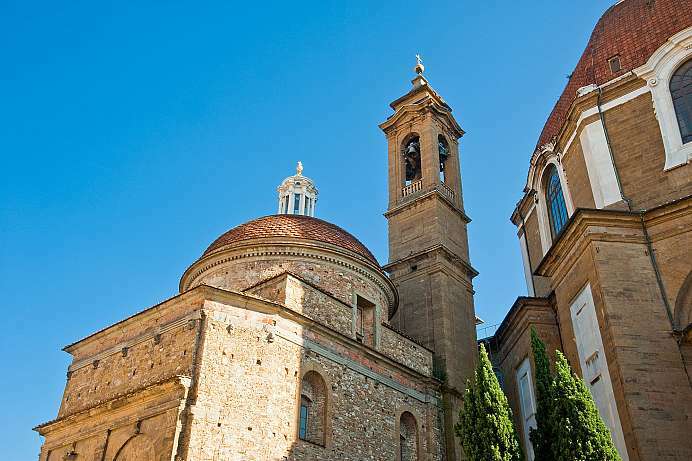 Apart from the cathedral, visitors can see the dome, the bell tower and the Baptistery of San Giovanni. 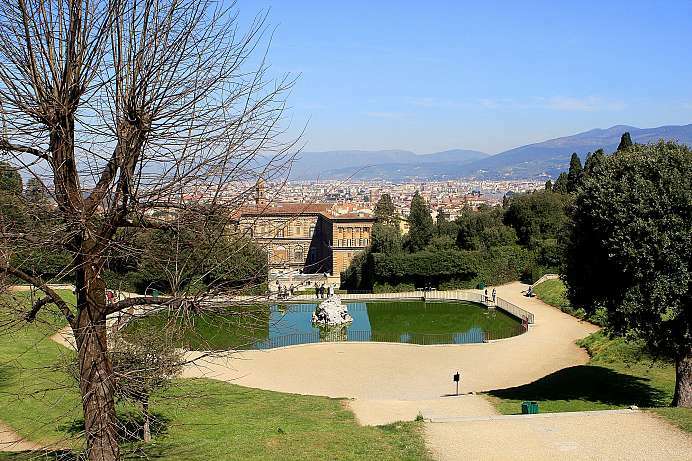 The magnificent renaissance park at Palazzo Pitti was the most famous garden in all of Italy during the 16th century. The landscape architects have created it in such a way that Florence is always a focal point. Today visitors can explore grottos, fountains, an amphitheater and even an Egyptian obelisk on the nearly five-hectare site. 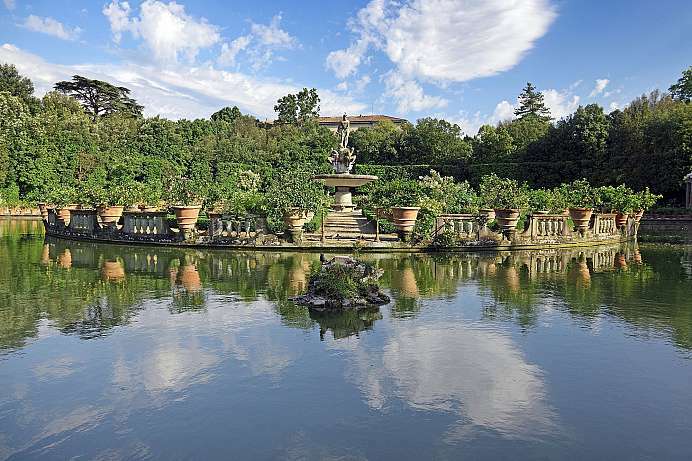 The Boboli Gardens are open daily. The palace from 1458, which belonged to the wealthy merchant family Pitti, is still one of the largest buildings of Florence. However, it only took on its current appearance a hundred years later when an even richer family, the Medici, moved in. The Pittis had been disowned after they had allegedly taken part in a conspiracy. After the Medici had lost their power, the dukes of Tuscany and later the kings of Italy resided there. In 1565 a kilometer-long corridor between the Pitti Palace and Palazzo Vecchio was built to shield the noblemen and wealthy from the plebs when they left their residence to walk to the town hall. Today dukes and kings have disappeared, so the palace only houses a few museums and exhibitions. The headquarters of the secular power in Florence was completed in 1314 and served the representatives of the Republic as a residential and conference building. For security reasons it was designed like a fortified tower with battlements and small windows. Next to the building the tower rises up 94 meters. After the government seized power the Medici palace was completely rebuilt, lined with gold and decorated with wall paintings from the great da Vinci and Michelangelo. Today the palace serves as the Town Hall. In the 14th and 15th centuries the strings of power converged here. 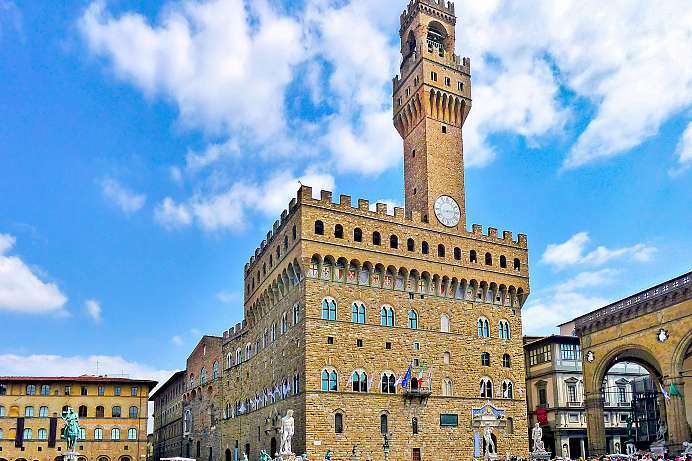 The largest piazza of Florence was lined with important buildings, most notably the Palazzo Vecchio. Still a major attraction and meeting point is Neptune's Fountain by Bartolomeo Ammannati. 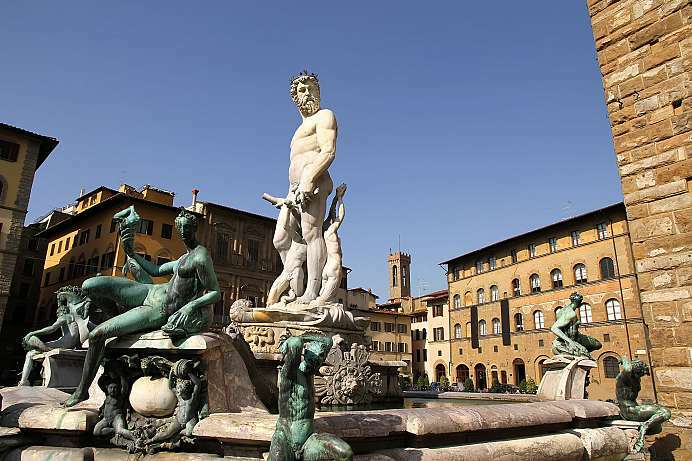 All attractions of the city can be reached on foot from the Piazza della Signoria. On the square itself there are several significant copies of statues, most notably the replica of David by Michelangelo. 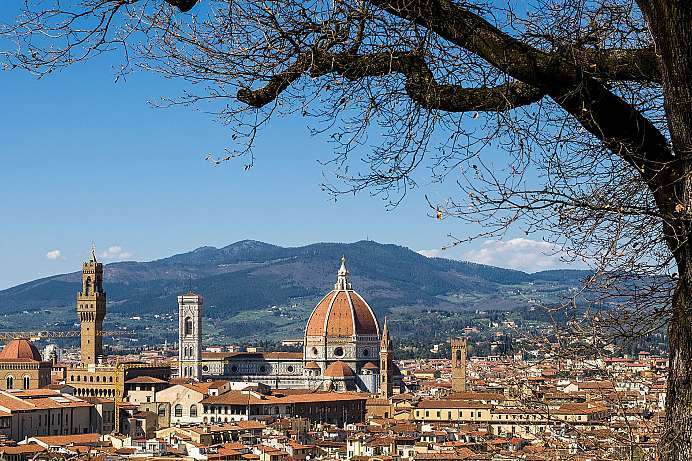 The most beautiful panoramic views of Florence can be admired from the Piazzale Michelangelo. The square was built in 1865 when Florence was the capital of Italy. An eight-kilometer magnificent avenue leads gently uphill to the square. There are some bronze replicas of works of Michelangelo, amongst others that of David. There is also a pavilion with a restaurant. 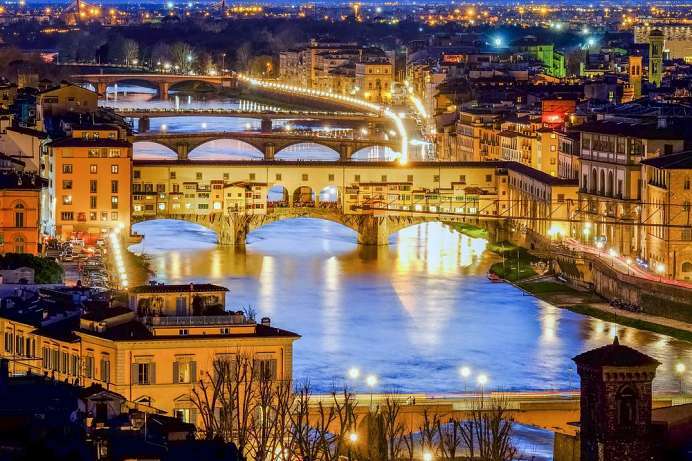 Especially at night, when Florence lights up below, the Piazzale Michelangelo is a popular meeting place. 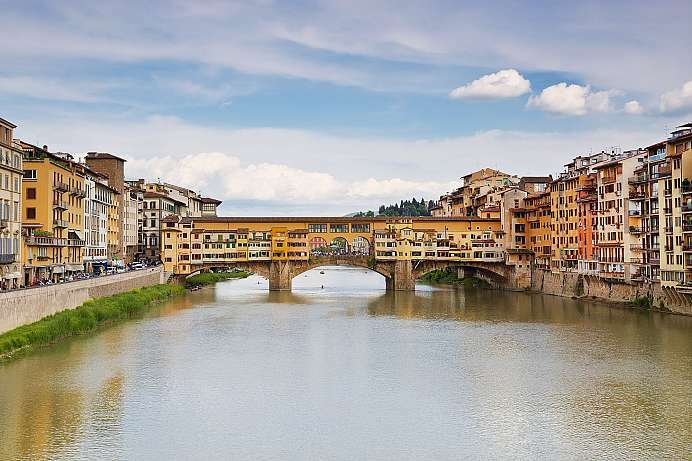 Built in 1345 the bridge over the Arno River is one of the oldest segmental arch bridges in the world. Along the sides there are buildings in which butchers and tanners formerly pursued their craft. Today jewelers line the bridge. 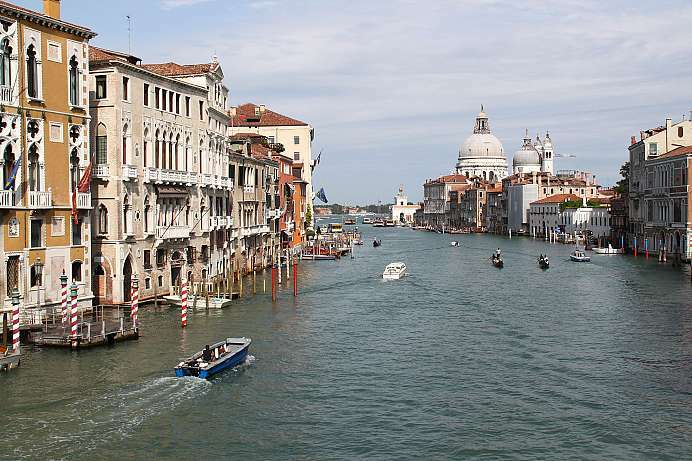 The best view of this masterpiece of Renaissance architecture is rendered from the low bridge, the Ponte Santa Trinita. From there one can walk along the river to the Ponte Vecchio. The basilica on the highest point of the city is considered one of the most beautiful churches in Italy. Although built around 1000 the Church is neither spectacular nor particularly large from the outside. But the interior is most convincing. The altar is in fact not on a level with the nave, but is elevated and one cannot look onto the the top of it. The unusual symbols on the portico are to this day a mystery to art historians. The ceiling has a very different style and really does not match the rest of the church. However, all elements work harmoniously with each other. There is a beautiful view over Florence when leaving the Basilica. This building, which dates back to 1580, was originally intended to house the offices of the city government (“uffici” is Italian for “offices”). Cosimo I. de Medici, the Grand Duke of Tuscany, had to tear down an entire city block just to make room for the new building. The final result was an elongated, symmetrical square flanked by two identical facades and connected to the banks of the Arno River via the Piazza della Signoria. Today, the structure houses the most important art collection in Italy. 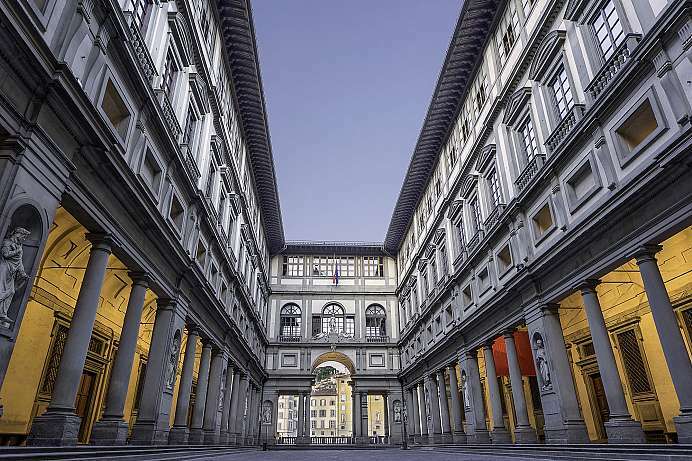 The Galleria degli Uffizi exhibits sculptures and paintings with pieces by Leonardo da Vinci, Michelangelo and Raphael. It also has the famous portrait of Martin Luther painted by the German artist Lucas Cranach.